In the beginning of April I was asked by one of my friends if I was interested in designing and building a kite to be featured in an upcoming issue of Design New England magazine. The magazine has a reoccurring element, Selections, that tasks design professionals with creating something and occasionally brings on a brand to complement the work. For this project, designers chose fabric for their kite from a selection of ROMO Fabrics. ROMO Fabrics is a fifth generation, family owned company out of the United Kingdom and is a global leader in furnishing and upholstery fabrics for all environments. Before construction, I spent a lot of time researching kite designs and it didn't take me long to be drawn to Leonardo da Vinci's hand sketched designs of flying machines from the late 1480's. In my daily life as an engineer, I often admire architects who still hand draw their plans and sections instead of using computer aided drafting software. Over the years, I have developed my own style of hand drafted structural drawings, and prefer that to CAD output. I also looked for inspiration from other inventors and engineers, Alexander Graham Bell being one of them. His geometric tetrahedral kites spoke to me as a mathematician and a structural engineer. I thought I might be sold on Bell's designs, especially after finding this sweet photo of he and his wife Mabel kissing thru the frame of one of his kites. 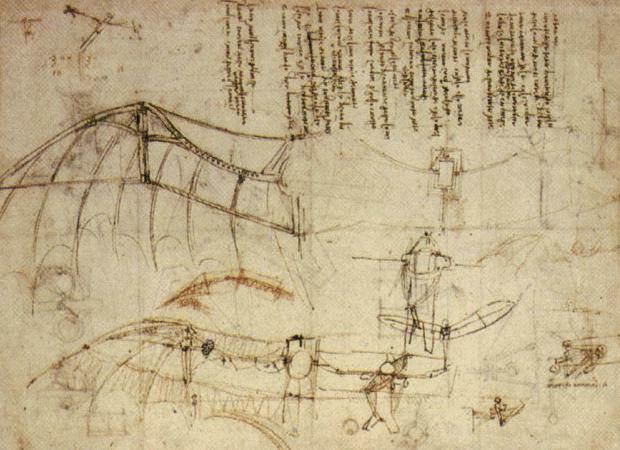 In the end I chose Leonardo's flying machine sketches as my inspiration for a couple of reasons. I knew that part of this project was to create something that showed off the fabulous ROMO fabric collection, and the wide wings and body shapes would provide an ample landscape to fit any pattern. Secondly, I wanted to step out of my engineering box and create something artistic and curvilinear, the skeleton and fabric surface challenging both the logical and creative sides of my brain. I started my process by sketching some ideas out on paper. I quickly realized that with the size kite I was planning it would need to be built into sections that were easily assembled when I got to the site where it was being photographed. In order to provide extra strength I decided to overlap the wings within body. I also wanted the wings to have some lift to them, so I thought about guy lines between the wings, tying them together. My final sketches of the planned kite. Illustration showing the lift I wanted to achieve with the wings. After I completed my sketches, I worked thru several different approaches with some fabric scraps and materials I had on hand. For the skeleton, I had planned to use green shoots from trees I found in the woods, but they proved to be way too difficult to work with. For the attachment of the fabric to the skeleton, I used some sheer fabric I had on hand to test different methods. I worked thru options with pockets, tabs and tying each joint down but didn't like the results of any of them. They were all too cumbersome and bulky for the light look I was trying to achieve. Going forward I used wooden dowels for the skeleton, and planned on gluing the fabric directly the the frame. I set to the task of creating the curved structure of the wings. I made a pattern of the wing shape that I wanted and traced the curve onto a board. I wanted to bend the dowels into the curve but wasn't sure how long or even if they would hold the shape. After doing some research I put both the dowels and several tea kettles full of boiling water into my bathtub for a long soak. I fastened some screws into the approximate shape I wanted, and after their bath, took the dowels and forced them into the form. After the dowels had dried in place I kept them in their form and clipped and then glued on the ribs to the main structure. Wing pattern I created from my kite sketches. Formed main structure of the wing. Placing the ribs onto the main wing structure. Once the wings were complete I started forming the main body. I ended up creating a frame with the outline I wanted, and a trapezoidal frame to connect my wings to. I was able to cross the wings within the frame to create the lift I had desired in the original planning. By threading the wings over the top frame, and under the bottom frame, each wing supported itself by cantilevering off the main body. This also made it easy to assemble and disassemble, making transportation a breeze. The final touch to the body was adding a curved secondary structure to the top frame, and added ribs to attach the fabric to. Once the skeleton frame was complete I was tasked with fastening the fabric to the frame. The fabric I chose from ROMO Black's Orchis collection, Claude Magenta, it is a lightweight linen sheer with a watercolor print over it's extra wide width. The sheerness allowed the skeleton frame to be seen thru the fabric, while the pattern worked perfectly and was repeated several times over the seven foot wingspan. Instead of hemming the edges I simply folded over the edge and glued it directly to my frame. I only attached the fabric to the ribs of the structure, and not the the main wings or body elements. Fabric on the body complete. Awaiting fabric on the wings. Instead of using a pattern to cut out each wing I glued one edge down and free form cut around the perimeter. Due to the sheerness of the fabric it was the easiest way to get the curved edges I wanted. After the shape was cut I glued each rib all the while turning in the edges along the top and bottom. To prevent the edges from fraying I applied a thick coat of Mod Podge around the perimeter of both the wings and the body. In addition to preventing it fraying it also provided some rigidity to the leading edge. What an amazing experience! It's been a week since I went down to Boston to have it professionally photographed and my kite will soon be gracing the pages of the July/August issue of Design New England.